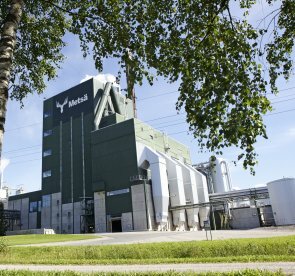 Finland's pulp production capacity will be particularly improved by Metsä Group's Äänekoski mill, with its production capacity reaching its target volume of 1.3 million tonnes per year in summer 2018. April 12, 2018 - New investments will have a significant impact on production figures for Finland's forest sector in both 2018 and 2019. Growth in 2018 will be particularly strong in pulp exports as Metsä Group's Äänekoski pulp mill (biorefinery) begins operating at full capacity. Exports of paperboard will also increase this year and next thanks to earlier investments. Exports of paper, the primary product of the forest industry, will continue to fall both this year and next, but prices may rise slightly. Exports of sawn goods will benefit from good prospects in all key market areas. Export prices of sawn goods is expected to rise as a result of increasing demand and accelerating inflation. The demand of sawn goods is being supported by the invigoration of the construction industry in key market areas, a trend that will also translate to a rise in export volumes this year, although the growth will see a decrease from last year. Around 77 percent of Finnish sawn goods production will go to export in 2018. Domestic demand is also expected to grow somewhat from last year due to increases in the construction sector. Sawn goods production is set to grow 4–5 percent in 2018 and 3–5 percent in 2019. The production volume of both pine and spruce sawn goods will see an equally steady increase. Due to increasing demand and inflation, the export price of sawn goods will turn upward this year, with a rise of 8–9 percent expected in the price of pine sawn goods. The increase is due to the recovery of the market in North Africa and increasing demand for pine goods in China. The export price of spruce sawn goods is expected to rise 2–3 percent, narrowing the price difference between pine and spruce. With the euro strong against the dollar and the price of roundwood having increased, the profitability of the sawmill industry will remain low. Spurred by investment, pulp exports from Finland will increase significantly in 2018. Production capacity will be particularly improved by Metsä Group's Äänekoski mill, with its production capacity reaching its target volume (1.3 million tonnes per year) in summer 2018. Exports will also be boosted by the newly completed extension of the UPM Kymi plant (from 700,000 tonnes per year to 870,000 tonnes per year of bleached northern softwood and birch pulp). Finnish exports will grow 14–16 percent this year and 1–3 percent the next. Due to growth in exports, the overall volume of pulp production in Finland will see a strong growth of 5–6 percent in 2018. Due to increased supply, the price of Finnish exports will decline in 2019, although prices will remain high. Paper production and export will continue to decline by 1–2 percent this year and next. The reason is the continuing decline in demand for printing and writing paper, which has been ongoing for many years and is expected to continue in the future. A modest rise in the export price of paper is expected in 2018, however. It will be caused by growth in the global economy and the general acceleration of inflation, the high price of pulp and a reduction in the capacity of paper production, all of which have reduced the supply of paper. In spite of the decline in production, paper will continue to account for about 34 percent of export earnings of the Finnish forest industries during the forecast period. Export volumes of paperboard will continue to grow steadily during the period, as will its average export price.